Janet Tavener, cast resin, 2010. Photo: Janet Tavener. If, as the old saying goes, “You are what you eat”, then artist Janet Tavener shows us that what we are is highly mediated, chemically coloured and genetically dumbed down. In her solo show, Out of the Mould, Tavener presents a suite of cast resin objects in the sumptuous drawing room at Vaucluse House. Some mimic transparent jellies while others take on the shape of fruit and veggies from the heirloom garden. Despite utilising the setting of a genuine Historic Houses Trust landmark, a stunning location redolent of genteel elegance and charm, Tavener isn’t just gazing back on the past through rose coloured glasses. The artist is keenly aware that man’s desire to dominate nature isn’t a new phenomenon. Tavener’s casts of heirloom produce look unfamiliar to modern eyes; the old fruits and veggies were weirder, wonkier, bigger and smaller. Her works draw attention to the fact that we have deliberately changed the shape and flavour of our food through selective breeding over thousands of years; a process of genetic manipulation which has accelerated rapidly in the last few centuries, and gone super-sonic in recent decades with the advent of gene splicing techniques. By focusing on old varieties of fruit and vegetables (tiny strawberries, a miniature pineapple, a massive round zucchini which resembles a medieval cap, huge knobbly lemons) Tavener points out that through our attempts to control nature we have sacrificed diversity for homogeneity, quality for quantity and tenacity for predictability. Not a great plan in the long term. Back in the day, all farmers were organic farmers. The old plants may not have been gorgeous, but they were tough, unlike the massive monoculture crops of today which can’t seem to survive without regular dosing with a vast array of chemicals. 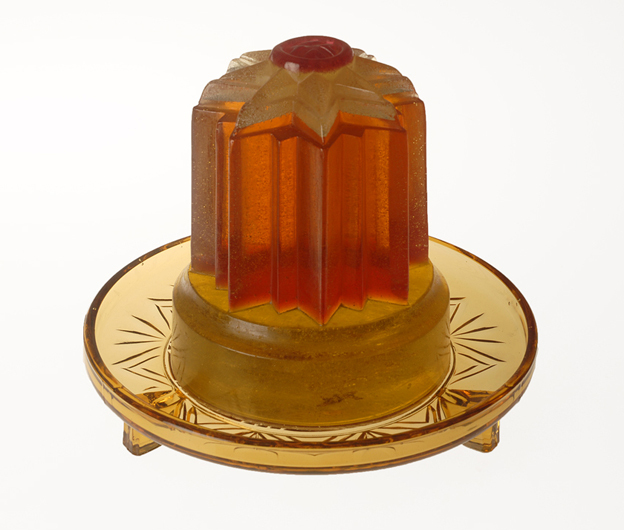 Elsewhere, Tavener uses the Vaucluse House collection of ornate, architectonic 19th century jelly moulds. Forcing food to take on bizarre and convoluted shapes can be read as a metaphor for man’s obsessive attempts to control the inexorable power of nature. Tavener’s jellies highlight the faint ridiculousness of this folly as well as the danger. 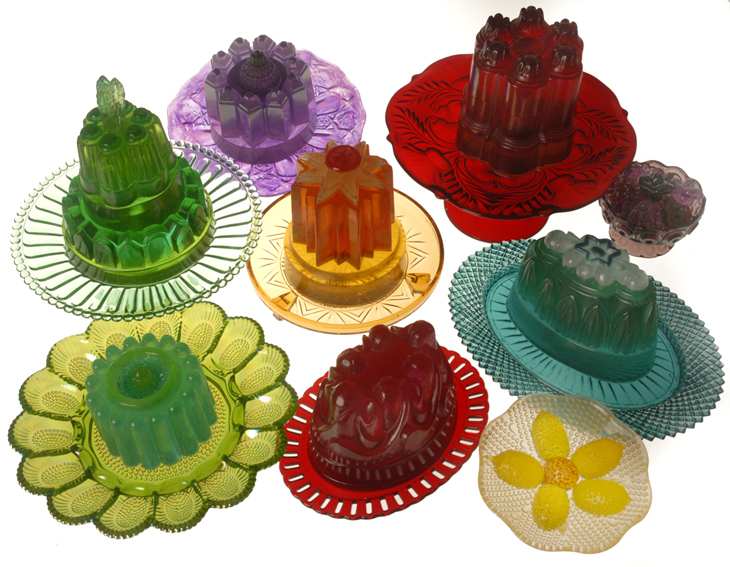 Just like a brightly coloured, glistening jelly, dominating nature may seem impressive and desirable in the short term, but in the long run it inevitably ends up as a big, wobbly mess. Janet Tavener: Out of the Moud is on at Vaucluse House until the end of October. Cost: adult $8, child/concession $4, family $17, members free. Janet Tavener is giving a talk on October 17, 10.00am-12.00pm. Cost: general $30, conc/members $25. Click here for more info. ← Ingrid Van Dyk: Is it possible to be too perfect?